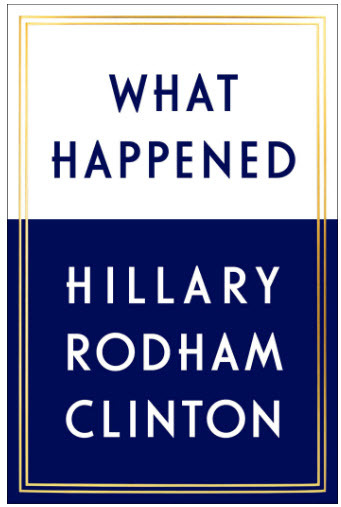 Hillary Clinton's book What Happened arrives in stores today. The book helps explain what went wrong in the recent presidential election where she lost to Donald Trump. In her new memoir, Clinton puts the blame on herself and explains her mistakes. She also blames Russian interference, Bernie Bros, James Comey, misogyny and more for the shocking upset. Clinton also states in the book that she will not run for office again. Publisher Simon & Schuster says, "Now free from the constraints of running, Hillary takes you inside the intense personal experience of becoming the first woman nominated for president by a major party in an election marked by rage, sexism, exhilarating highs and infuriating lows, stranger-than-fiction twists, Russian interference, and an opponent who broke all the rules. This is her most personal memoir yet." Clinton told CBS Sunday Morning that she is "done with being a candidate" but she won't give up campaigning for others. In What Happened, Hillary writes, "That doesn't mean I'll ever run for office again. It does mean I will speak out on the causes I care about, campaigning for other Democrats, and do whatever I can to build the infrastructure we need to succeed. What Happened is available to purchase in bookstores and online at Amazon.com. It is currently the #1 bestselling book on Amazon and will top the bestseller lists. Here is a video clip of Hillary signing books at the Barnes and Noble store in Manhattan, NY.